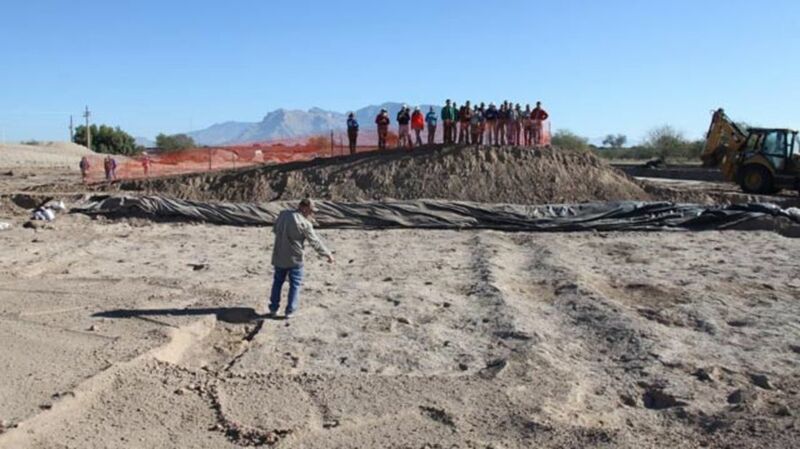 This past November, archaeologists uncovered dozens of human footprints preserved in the ground of a construction site north of Tucson, Arizona. Radiocarbon dating indicates they were left between 2500 and 3000 years ago, making them the oldest human tracks discovered in the American Southwest. A small irrigation ditch and depressions that might have held plants were also discovered in the 161-square-foot field. The tracks were made by a few adults and at least one child, probably as they tended to their crops. A print from a dog, likely the companion of one of the farmers, was also found inside a human print. Experts say the field itself looks to date to sometime in the Early Agricultural Period, between 2500 BCE and 50 CE, when farms first began appearing in the American Southwest. Archaeologists attribute the prints' impressive condition to a sudden flood from a nearby creek. Soon after the tracks were left, the overflowing creek covered them in a mica-rich sandy sediment that would keep them preserved for millennia to follow. Researchers are currently working to salvage some of the prints and document the rest as best they can, as the site will soon be paved over.